Please, pretty please foster or foster/adopt me. I’m a sweet girl who needs a home. Meet our marvelous Missy! 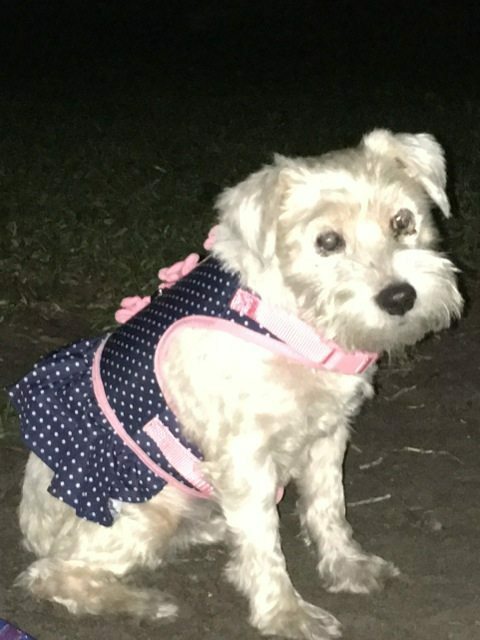 This sweet schnauzer girl has some special needs but that does not stop her from enjoying life. Missy had entropion, a condition that when not properly treated can cause blindness and extreme dry eye. She does have some vision and this allows her to get to know her surrounding and find her way around quite well. She loves to play with her toys and enjoys sprawling out on the grass to feel the grass on her tummy. Missy gets along with all people, cats and most dogs. She would do best in a quiet home where she is the only dog or with a larger elderly dog. She needs a gentle sweet person who has the time to guide her until she gets adjusted to her new home. Missy will need surgery for her eyes which will be covered by SAFE. She will also need eye drops 4 times per day for a few months and twice per day for the rest of her life for her dry eyes. If there is a special person out there willing to put in a little effort with her, she is a sweet and wonderful dog with a charming personality and will give back the love ten-fold. She is 5 years old, weighs approximately 20 lbs is house broken, healthy, has been neutered, microchipped and is up to date on all her vaccines. PS. Sweet Gus was adopted last week!!!! !